For a good manual therapist that is absolutely true. We use our palpation skills to look for soft-tissue tension, check for alignment issues, and assess proper motion/movement. We do more than simply ultrasound and exercise you as a patient. There are in fact a plethora of tools at our disposal. Below I’ll describe a few of them for you. Often times muscle tension needs to be addressed or joint dysfunction may persist/return. For example, after an injury or surgery, adhesions and scar-tissue may form in the area, limiting normal range of motion (ROM). With soft-tissue mobilization, those adhesions can be broken down. In addition tissue fluids can me moved so swelling is dissipated and circulation can improve. At ESPT, we are one of the few clinics in the area that offer Sound-Assisted Soft-Tissue Mobilization. By using special tools to help break down the soft-tissue and fascial restrictions, we can better treat ongoing muscle and tendon issues (tendinosus) in ways our competitors can’t. Muscle spasms can also respond to a restricted joint, so simply heating and stretching an area may not produce lasting results. By mobilizing a stiff joint, we can restore proper movement and range of motion, thus taking stress off of the surrounding muscles. 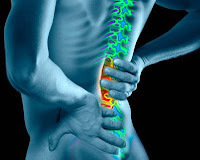 These mobilizations should be painless, but on occasion can be a little painful if the joint is very stiff. In any case, there should be no lasting symptoms after the mobilizations. At ESPT, we are the only clinic in the area with the ATM2 by Back Project. You can read more about it in our blog here. With the ATM2, we can “reset” your neurological system so that you do not perceive pain. Muscles often respond with guarding/spasm, when we are in pain. 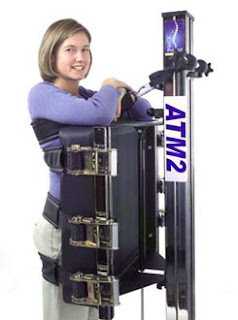 By supporting your body with the ATM2 apparatus and eliminating your pain, your muscles will have a chance to relax and return to their normal function, instead of tightening up to protect you. This is a special technique using voluntary contractions by the patient to mobilize restricted joints and lengthen shortened muscles. This procedure is a little more active as compared to joint mobilizations, since it requires patient interaction to contract certain muscles against a counterforce provided by the therapist. These are tolerated very well and do not usually stress the joint. This is a more aggressive technique that takes a joint to its restrictive barrier and thrusting with a low amplitude to restore proper joint motion. If it is used properly, increased motion and decreased muscle spasm should be noticed immediately. Therapists have to go through special coursework/training in order to perform these mobilizations. At ESPT, we are fortunate to have the only Certified Orthopedic Manual Therapist in the area. You can read about it in our blog here. And Joey is qualified to perform these high velocity, low amplitude mobilizations. Come see him if you have back pain/neck pain that has not improved with physical therapy elsewhere. In today’s health care environment, physical therapy clinics can no longer just be “gyms.” Patients cannot come in and simply run through exercises. Therapists have to show what they are capable of and how they can provide a unique, professional service that others cannot. We need to prove our worth, so that patients know they are getting quality service and care with their insurance dollar. If you haven’t experienced any of the above techniques in your physical therapy treatment or would like to find out more about them, feel free to contact us at Elite Sports Physical Therapy @ 510.656.3777. 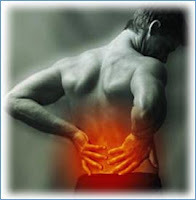 For this entry, I’d like to continue the discussion on treating low back pain. As I’ve mentioned before, PT’s that simply focus on treating pain with modalities like ice, heat, e-stim, ultrasound are kind of archaic. That is a wonderful adjunct to a physical therapist’s toolbox, but a good PT never focuses on a painful area and treats that area solely. The goal of treatments should be helping patients gain sustained functional improvements. And I’ve seen that most with helping patients improve flexibility/mobility and increase core strength/stability when treating low back pain. At ESPT, we are now excited to offer to the Fremont/Newark/Union City community: The ATM2 by Back Project. The ATM2 is a cutting edge rehabilitation tool used currently by top teaching hospitals, athletic rehabilitation facilities, and professional sports teams. It’s rapid growth in popularity is the result of its unparalleled ability to provide immediate and sustained results for decreasing pain and increasing motion in suitable users. The ATM concept focuses on eliminating a patient’s symptoms/complaints by normalizing impaired movements. By effectively positioning a patient on the ATM2 device, the clinician is able to find a pain-free position for a patient that may have not been possible previously. When this position is found and stabilized, a series of gentle re-training movement exercises are performed to bring about immediate pain reduction, increased range of motion, and improvement in quality of motion. In recent studies, it’s been shown that muscular activation strategies are altered when there is pain. This altered activation strategy is a protective mechanism in acute injuries, but it can also become a problem for chronic injuries. When normal muscle activation strategies are restored is usually when individuals are successful at relieving pain and restoring normal motion. ATM studies have enabled clinicians to help patients achieve an immediate, average of 60% reduction in pain and decrease the number of treatments needed to resolution by over 50%!! There are only a few select clinics in the area with this equipment. To find out more details about us or the ATM2, feel free to call Elite Sports Physical Therapy at 510-656-3777 or check out our website at www.espt-ca.com.